Although many people say they would enjoy working from home, telecommuting is not for everyone. Studies show that extroverts are more likely to be happy and productive in a telecommuting position, with a tendency to be more assertive and organized than their introverted counterparts. Of course, whether or not they are an extrovert or introvert is only part of the equation. They need to be the kind of person who works best without supervision and hard rules. It’s always a good idea to share recent company news and any short-term or long-term goals with your remote employees. It helps them to stay motivated and understand how what they do affects the company. If they feel they are being kept informed, they will feel like they are working with you rather than just for you. Get savvy with web-based sharing tools like Google Drive and Skype. Google Drive embodies all the essential office tools. Everything from word processing, spreadsheets, and presentations are stored on the web and are easily accessed from any computer. The Share feature allows users to easily collaborate and edit the same document or spreadsheet in real time, with a handy chat window available for added communication. Skype is a great substitute for in-person meetings. The video feature allows for more personal interaction and the screen-share feature permits your remote employees to visually show you what they’ve been working on. It’s important to make your telecommuting employees feel like they are truly a part of the company. Make sure you keep them in the loop of all the latest hires and company news, as well as acknowledging personal milestones like birthdays and work anniversaries. When possible, get them involved with other team members or remote employees to collaborate on projects. 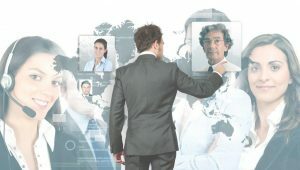 Managing your remote employees can be a unique challenge from the traditional office setting, but as long as you hire the right people and check in with them to make sure they are on the same page as you, they can be some of your best employees!